You're going to need to invest in a really good planner to keep you organized in college. And don't think you can just write your college assignments in the same notebook you take notes in. Trust us - if you try doing that, it won't last long. You could very well end up taking 15 pages of notes in one class on one day. Unfortunately, it's true and you'll also want to invest in plenty of college pens to get you through the semester. If you're taking 15 pages of notes in one day, are you going to want to sift through those notes later in the same day to find your college assignment? No, we didn't think so. Invest in some cheap dorm supplies to keep you organized with our Globe Trotter Wall Calendar Wall Art - Peel N Stick! Our Globe Trotter Wall Calendar Wall Art is one of those dorm essentials that will last you a long time and have multiple functions. 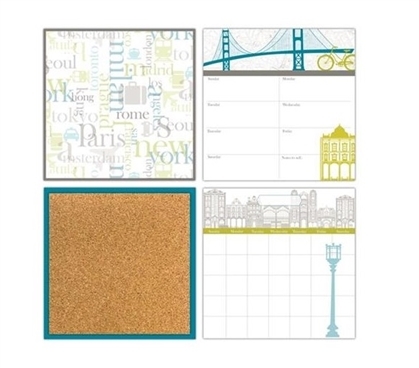 This set has quite a bit of the college supplies you need to stay organized for your college classes. You'll have a corkboard with push pins and a dorm message board with a dry erase marker to leave notes for your roommate. You'll also receive a weekly and monthly planner panel so you can plan out studying for exams and what essays and other assignments you will have to do for college. With this Globe Trotter Wall Calendar Dorm Wall Art on your dorm room wall over your dorm desk, you will be more organized and you can't possibly forget when you have an exam or your English Essay is due. Plus this Globe Trotter Wall Calendar Dorm Wall Art also adds to your dorm room decor!